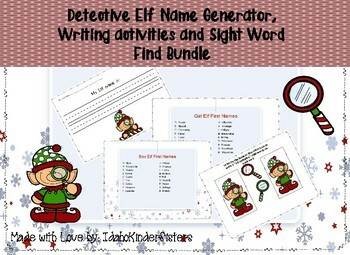 Use Elf Detective Cards as Write the Room or Word Work: Print, laminate and cut out the elf cards. Each card has 2 sight words on them that students can use to either pick out of a bucket and write the words on the corresponding sheet for word work, or you can hang them up and the students can walk around the room for a fun Write the Room activity! 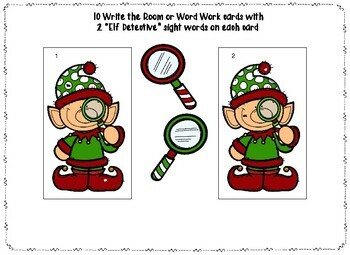 The Words are small so they will enjoy playing “elf Detective” as they find the words with a magnifying glass.Elf Writing Activity: Elf names have been generated for students by the first letter of their first name and the first letter of their last name. You can also use middle names so students don't have the same name. Write the name on paper or whatever works best for you. 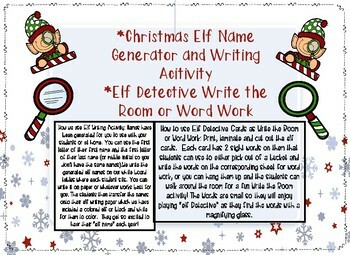 The students then transfer the names onto their elf writing paper which we have included a colored elf or black and white for them to color. They get so excited to hear their “elf name” each year!